I recently attended a new professional activity. I thought that this was very akin to personal learning networks in nature. I attended 3 live twitter chats. I loved the learning. Also the moderators(hosts) left the content available for asynchronous review on their websites. I felt outclassed in these arenas. I knew the venue was potentially world wide, and I knew that my conclusions may not be practical for other circumstances. I still learned a lot and I think I contributed in a positive way as well. 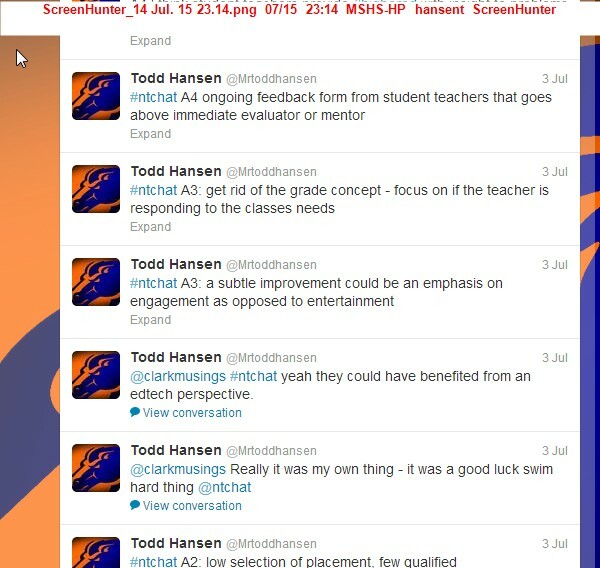 #ntchat, – this was my first live twitter chat and luckily i had been given instructions on the Q/A format in the resources. The moderators also reminded us, but I needed the structure in order to follow along. When it first gets going, the chat can really scroll by fast. I noticed in this chat some genuinely consistent struggles from pre-service teaching preparation that I had never addressed in myself. In the course of one hour this chat offered hundreds of sound and useful ideas for how teachers can be better prepared to help their students at the beginning of their careers. Hopefully my answers benefited others, I did hear back from one other participant, and I appreciate how the nature of these activities is to offer ideas for others. It was really beneficial. 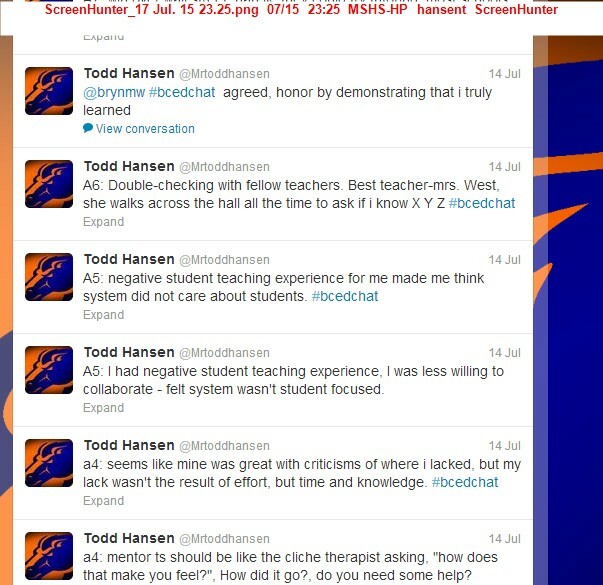 The #bcedchat was similar in it’s topic. It focused a great deal on pre-service training. It had a longer focus on placement decisions, than the #ntchat. I chose this chat to focus on teaching and gather perspectives from a different region. The #blogchat was cool. It wasn’t distinctive to education. It had many business minds. I did like the tips however. They really focused a lot on what they wanted the reader to do when they saw the blog. They discussed topics like how to handle comments, popups,and multimedia. I found that this chat really inspired me to go apply my learning. overall live twitter pd has the overwhelming gold star for documenting ideas from so many professionals. The 3 live webinars was a challenge for my schedule(even with the sufficient alottment of time of 3 weeks) . – my excuse is that I was finishing a capstone research paper, getting over a cold, dealing with a broken air conditioner, on the road, presenting presentations, and much more last week. That really drove me to the last minute on live webinars. So, I didn’t find live ones that I could attend(uggg) however, I did find huge archives full of recently recorded ones. I will share some of those resources and my learning below. A few webinars worth noting on lightspeedsystems.com . I particularly like the Ipad saity and success webinar, which helps teachers use a 1:1 ratio of electronic device:student in more meaningful ways. Overall while I am disheartened that I could not give this a better effort, I do still believe that I gave this assignment great effort, and accomplished the true purpose of the task. Hopefully, that will count.